To start near the beginning, I would have loved to see the first generation of 4-4-0s creep across the nascent railroads on the American East Coast and then begin their march westwards into the plains. The first generation of these machines, built in the 1830s, had a boiler pressure around 90 psi and a top speed of about 15 miles per hour. These numbers were never significantly improved until Mogul and Consolidation-type locomotives began to appear in the 1860s. The American types look toylike, compared to their descendants that populated the last strongholds of steam a century later. They are little more than grasshoppers with a slightly less fragile and more colorful exoskeleton. Yet, these are the machines that knit the American continent together into one iron network. It was those small engines, technically unreliable and prone to derailment, that brought in waves of European settlers, that allowed for the entire ecosystem of the central United States to be disrupted and the native population to be decimated. Many of the cities which are now significant centers of population and industry began in this era as railroad exchange points. The United States was--to a degree unique to all other nations--built and shaped by the railroads. Early railroads and steam locomotives in particular required many people to keep them in good working order--something which they never grew out of even as technological developments tripled boiler pressures and exponentially increased available drawbar power. 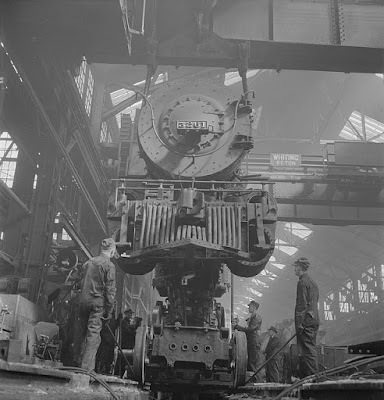 Several articles posted to this blog have alluded to that fact, but nothing written in the present day can give an accurate depiction of the sheer scale upon which locomotive maintenance once took place. The steam locomotives which survive today are lovingly doted upon, and it isn’t unheard of for inspections and overhauls to take more than a year. That’s to be expected, when repair money is hard to come by and the locomotive’s owners know that any repairs carried out should ideally last a full 14-year inspection cycle. This is vastly different from the practices of railroads that had hundreds of steam locomotives in service at any given time, all of which required daily attention and cycled in and out of monthly or yearly overhauls. 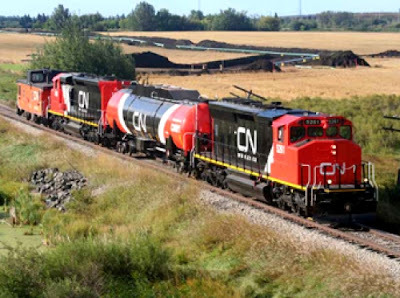 We no longer have need for machines that can grind down the siderods for three or four locomotives at a time, or teams of men who can sweat off dozens of wheel-tires in a shift. These industrial practices have been lost to time. 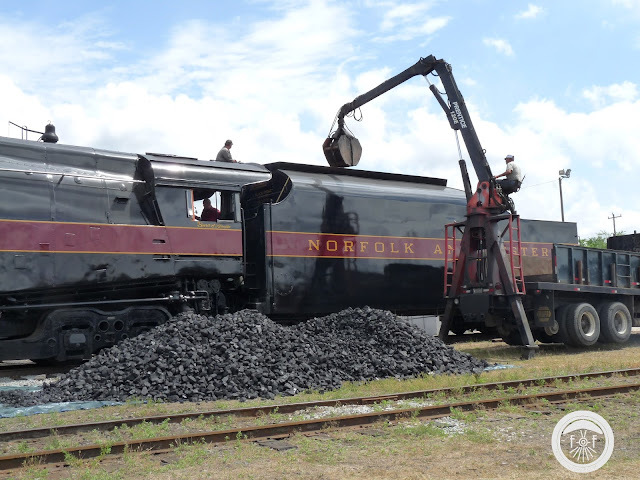 to activity taking place on site during the heyday of steam. Looking at history from the present gives us the advantage of knowing how chains of events are ultimately going to conclude. It’s sometimes difficult to remember that people living through any one point on a timeline did not have the same insight into how current events would end. When the first diesel locomotives were offered on the market, for instance, there was little indication that one day that form of motive power would completely supplant steam locomotives. It took several decades before the technology was developed enough to provide viable competition and even then, there was much debate among corporate leader and lay people alike as to which form of motive power would ultimately triumph. It was, at the time, an open gamble. I can’t fault anyone for thinking of this period as one of the most depressing, even traumatic, in all of railroad history. To me, though, I think this would be one of the most interesting times to visit. The most vivid snapshots are those that capture something in the midst of transition, and there is much to be written and recorded from the ground when people began to understand that a long-entrenched to their daily life is beginning to slip away. Most of the railroading events and landmarks I consciously seek out are relics of the past. I put the majority of my energy into preserving and cataloging the things that are in very real danger of disappearing. The more time passes, the more history distills down into a few memorable events, and the more we assume that surviving artifacts convey history in its totality. Accumulating years boil away the finer aspects of popular culture and the political undercurrents that characterized a certain time and location. Any time I try to tease these hidden aspects out of the past, it makes me wonder what aspects of the present, railroad-related or otherwise, will be lost to the years or remembered inaccurately. That feeling of futility, that the only way to truly understand some part of history is to actually live through it, was the big takeaway from my recent trips to Spencer and Omaha. We’ve done a decent job of preserving steam locomotives for future generations and with a bit of care can make sure that mid-to-late 20th century is well represented too, but railroading is best understood as a system. Most aspect of historic railroading were abandoned around the end of steam, others evolved and disappeared as technological improvements appeared. We have preserved precious objects but failed to preserve their context: That is impossible to do without freezing time itself. usually associated with the past. From www.railwayage.com. Some day, an engineering innovation or a drastic change in economics will spur modern railroads to evolve into something different, though I have a hard time imagining anything else that will ripple through society in the same way that the transition away from steam did. Successive generations will look back on the present and single out a few things that seem representative of this era. The farther we are removed from this present period of time, the more those will come to symbolize this period in time. Knowing this creates a paradox for history and preservation-minded people. We understand the value in preserving an accurate picture of our contemporary years, but without being able to look into the future and envision what people in the future will see, we can’t know where gaps in the record will form and what things we should take care to record and preserve. If I were to speculate as to what would become most iconic of the early part of the 21st century, I’d think that single-cargo trains, particularly those carrying oil, would be a decent place to lay a bet. They are hypnotic in their monotony, and their exclusivity of composition seems to somehow compound their momentum. Given that oil trains have been involved in a number of dramatic wrecks, I can imagine future generations romanticizing train crews in this era as we do fighter pilots from a hundred years ago. Time may transform men and women just trying to get through another day into dashing characters who lust after adrenaline and thumb their noses at danger. We may even wonder how they were blindsided by the arrival of natural gas locomotives, or whatever other technology is next to make a profound impact on the railroading industry. We'll never know until the future actually arrives, and when it does, in the end we'll probably conclude that the only way to really appreciate history was to live it.